OPINION: The Cooper Cronk will-he-or-won't-he-play saga was an unnecessary sideshow the NRL, and other Australian sports, need to eliminate. 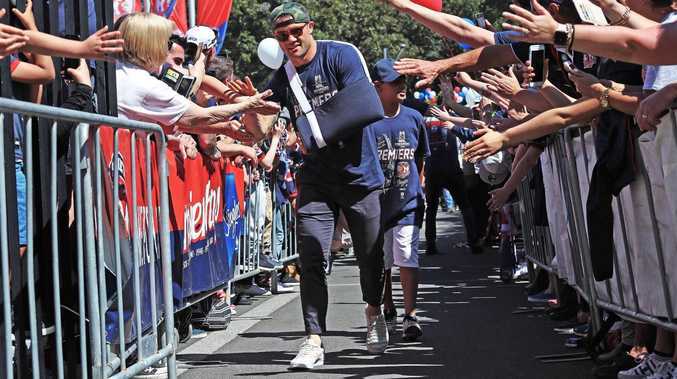 The Roosters halfback somehow played through a 15cm break in his scapula to help his side win Sunday's NRL Grand Final. He didn't do much from a statistical standpoint, but his presence and coaching made a huge difference to his side. Cronk playing with such an injury is another issue altogether, but the drawn-out drama surrounding his involvement was something that should not be repeated. The result would have been the same had the Roosters said mid-week that Cronk would play. They protected the champion halfback from defence, he picked his moments to handle the ball. The game plan was simple, effective, and executed to perfection. If a player is carrying an injury and then decides to play, that is a risk the player, coaches, and the club take knowing the opposition - and their fans - know exactly what is going on with their team. In my growing support and viewership of American sports - led by Major League Baseball, NFL and NHL - I'm captivated by their use of a fully transparent injury list. Teams place players on injury or disabled lists with full details of the injury, how it was suffered, severity, treatment options and an expected return. Sure, there are still questions about the availability of certain players - the absence and condition of New York Yankees star Aaron Judge after his late-season wrist injury was regularly questioned and updated - but it is nowhere near the level of the Cronk saga. It takes away from the game. It takes away from the sport. Gamesmanship is one thing, but to blatantly lie about a player's health throughout the week for an advantage undermines the sport's integrity. If a sport has no integrity, then why bother following it? There is some merit to clubs keeping an opposition club guessing as to the availability of its best players, but for me, sport should be about which team is the best at playing sport, not who is better at playing unnecessary mind games. What do you think? Send an email to sport@frasercoastchronicle.com.au.